Country Kitchen takes a farmers’ market theme. 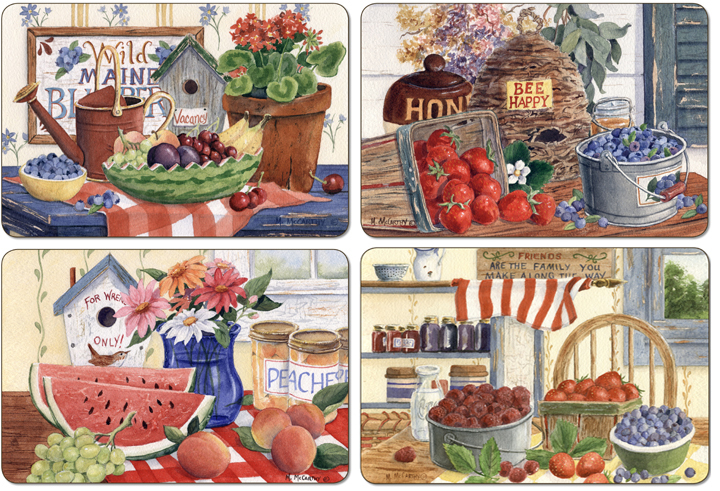 It shows a variety of fruit on a country kitchen table mingled with the home baking and cooking that we all love. Each mat is different, but all show the colour and vibrancy of the fruit, the flowers, preserves and the home baked goods. Each set includes four different images. for her evocative wildlife and decorative Americana images. that represent and reflect the simple, natural world around her. Unique glossy finish to enhance design. featuring a variety of fruit on a country kitchen table mingled with the home baking and cooking. European-style size: 8.5" x 11.5"